Hello Dealsnloot Readers,now Ebay has come back again for loot deal only for new users. 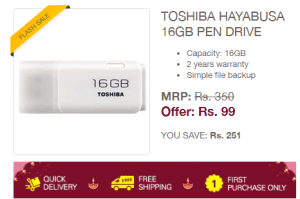 This time Register and get TOSHIBA HAYABUSA 16 GB PEN DRIVE worth Rs. 350 at Rs. 99 + Free Shipping. Offer valid on First Come First Serve Basis only.In market you will Get 16 Gb pendrive in around 500-700 Rs. but in this ebay loot deal you can get it in just 99 Rs.So Hurry !!! Grab This Loot Offer On This Diwali. How to get Toshiba Hayabusa 16GB Pen Drive Rs. 179 ? ** If the user is not a First Time transactor on eBay, then he/she will not be eligible for this product. Manufacturer warranty of 2 years is applicable on this product. Hence, it will not be covered under eBay Guarantee. Now you don't have to verify Your Mobile number.